iEmbellish: SNSS November release blog hop! SNSS November release blog hop! Sweet 'n Sassy Stamps is celebrating their 7th birthday this month as well as the new products available now for purchase for November. For all the specific details on each new product as well as the new challenge going live today, please hop over to the SNSS company blog. For my first card, I played with the new Birthday word die and the coordinating Companion Words die. I die cut it from some light blue card stock and then just die cut the candle from both yellow and orange felt scraps and glued them together. Then, I die cut the word from a piece of card stock and glued it to the felt for a bit of backing to help stabilize the felt a bit bit. I went CAS with this card because I was thinking this card would be fun for a 'tween' boy or girl and didn't think they'd be impressed with all the extras that us moms/crafters enjoy! lol! My next card uses the beautiful new Bare Tree die along with the new Scripture & Sentiment Companion stamp set. Another CAS card this time for my 'thinking of you/sympathy' stash. I made it flat, so it would be easy for mailing it out. I don't know about you, but I have been busier this past summer and fall than ever. As my children get older, they need me more than ever - have you moms found that to be true as well? At any rate, my time for stamping has decreased so much, so I am falling in love more with the clean and simple style of card making and images that are so lovely on their own that they don't always need to be colored. 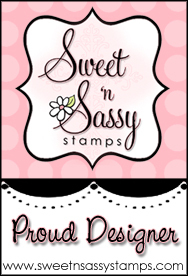 Sweet 'n Sassy Stamps' images fit the bill perfectly, in my book. 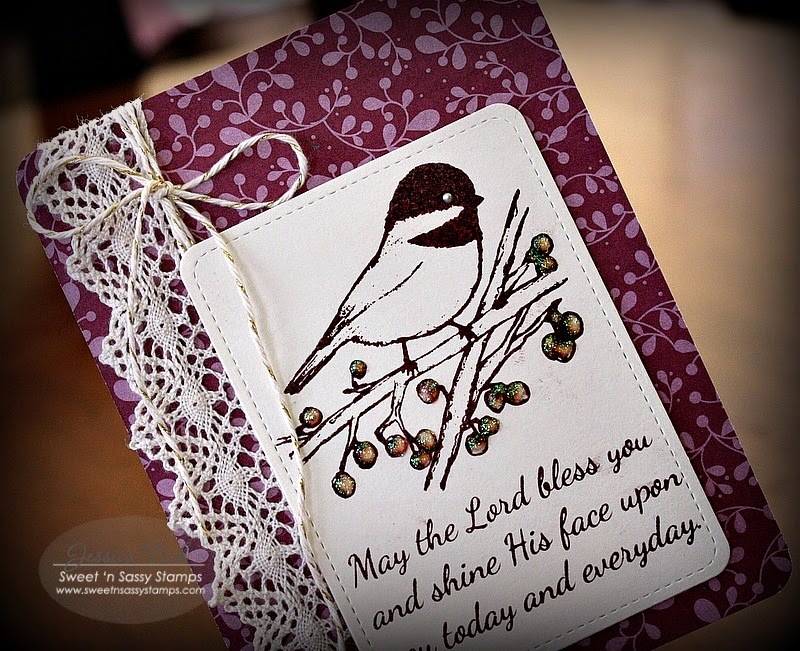 This chickadee image is GORGEOUS stamped in burgandy ink to match the card front patterned paper. A bit of trim, twine, a liquid pearl drop on the bird's eye and glitter and it's done. 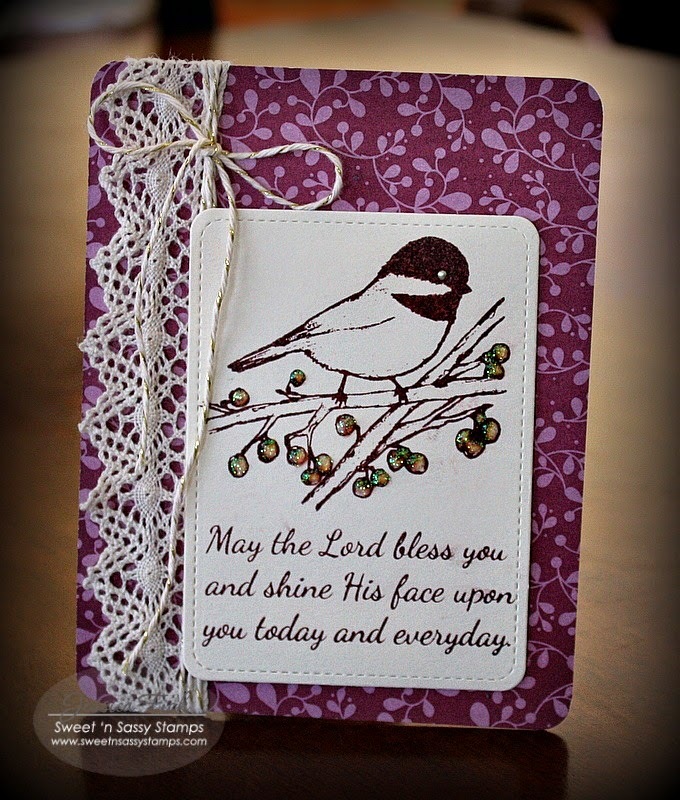 Korin released the coordinating God's Purpose die for this sweet birdie, but I choose to stamp the image directly on the journaling card and stamped the image in the same burgandy ink. I added just a bit of stardust stickles to the berries. Stickles makes the die ink bleed a bit, but I was ok with that since I knew it would add a bit more color to the image. Several designers are joining me today in celebrating the new products now available. You can view their photos/link below! Click on the pictures to be taken directly to their blogs for the eye candy each of them have prepared for today! Have a wonderful Friday and a blessed weekend! 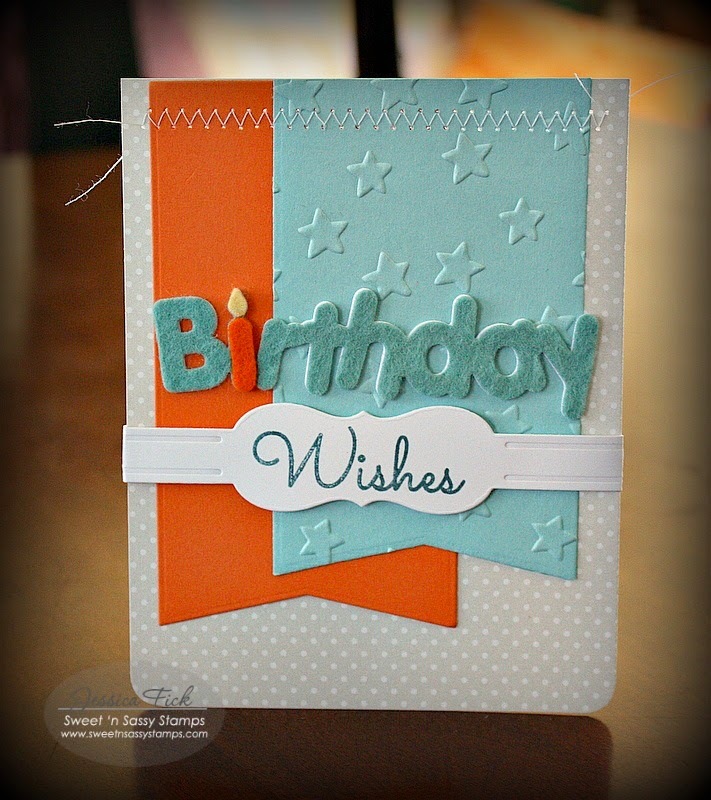 Adore the sewing and felt on your birthday card...so sweet! Your other cards are delightful as well!! 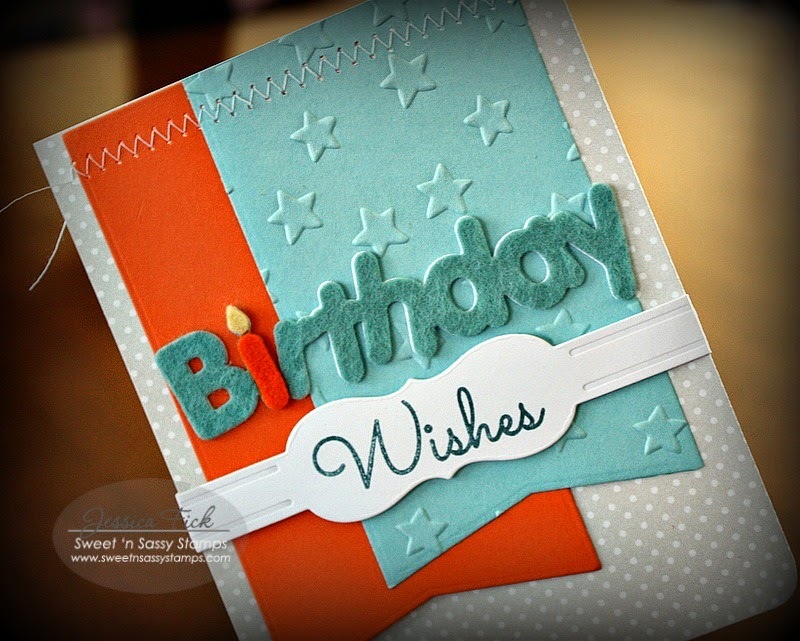 I love the aqua and orange colour combo on your birthday card and the fabulous doily bg for the bare tree! You are a master with the doilies! The lovely lace and twine set off the chickadee perfectly with the rich bg! All of your cards are fantastic. I love the simplicity and elegance of the last two and the first card is perfect for a tween/teen! wow!! love these cards!! they are gorgeous!! awesome stamps!! Lovely cards Jessica - yes, the older the children get the more they need you, especially to talk to - keep the communication open and you will keep them close to you. Lovely cards Jess. Especially love the first one with the felt die-cut word. The other two are so elegant with the doily and the lace strip. Love all three of your CAS creations, Jessica! Each CAS design is full of texture…embossing, felt, stitching, sparkle…just beautiful! Thanks for sharing the versatility of this release! Hugs! These cards are all so beautiful! I like the felt on the birthday card, the doily with the tree and the lace trim for the bird. All of the cards are so pretty but I especially like the bird on the purple background. He's on my "must have" list. stitched cards and doily embellishments are perfect! Love your cards. Love the sewing on the card. Beautiful cards! Love that first one with the felt "birthday" so cute! your felt letters are perfect and oh my, there's my friendly little chickadee. Lovely! All your cards are wonderful! Lovely cards. I love love love the felt on the first one! Genius!